As those who have worked with me could tell you, I have a soft spot for books about wacky chickens. I don't know what it is, but I'm drawn to them. So, of course, I put together a chicken storytime. 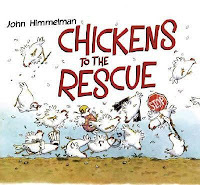 Chickens to the Rescue by John Himmelman - Every day of the week, something goes wrong at the farm. Luckily, there are chickens to put everything right again. The Wolf's Chicken Stew by Keiko Kasza - When Mr. Wolf decides to fatten up a chicken for some stew, his delicious gifts have an unintended consequence. Hungry Hen by Richard Waring - Every day, the hen eats and eats and gets bigger and bigger. When the fox on the hill can stand it no more, he rushes in for his dinner but gets a surprise instead. Hattie and the Fox by Mem Fox - Hattie the black hen spies something lurking in the bushes, but none of the other barnyard animals care until she identifies it as a fox. The Most Wonderful Egg in the World by Helme Heine (felt story) - The king will make one of the beautiful hens into a princess - whichever one lays the most wonderful egg. But how to decide? Of course, we needed to sing and dance, so I also threw in a little Silly Dance Contest by the incomparable Jim Gill. I turned The Most Wonderful Egg in the World into a felt story and that worked pretty nicely. I created felt pieces for the three hens, the king, a nest, the three eggs, and three princess crowns. We love Chickens to the rescue at my library! I can't wait to see the sequel this fall - Pigs to the Rescue! Some of these chicken books are new to me, it's definitely time for another chicken storytime! Your felt pieces are lovely! My Life as a Chicken, by Ellen A. Kelley is the best chicken book in the whole wide world. Just saying! I guess you can tell by my blog name (Book Chook - a "chook" is Australian for chicken!) that I love all things feathered too. Thanks so much for this list. I'm on it! I LOVE your felt pieces. Parents and kids must thoroughly enjoy your storytimes.